Two days following the Christmas day outage that laid low both Xbox Live and the PlayStation Network, users are still having trouble connecting to PlayStation Network services on PS4 and PS3. Update: Sony points to disruptive traffic as the cause of its network issue. While a tweet posted early this morning gave PlayStation Network users hope that all was returning to normal following two days of crippling downtime, as of this writing users are still having trouble connecting to the PlayStation Network on the PlayStation 4, while both Sony consoles are having issues connecting to the PlayStation Store. Testing the service myself, on the PS3 I was able to connect to an online match of P4 Arena Ultimax just fine, but have been unable to access the store since last night. 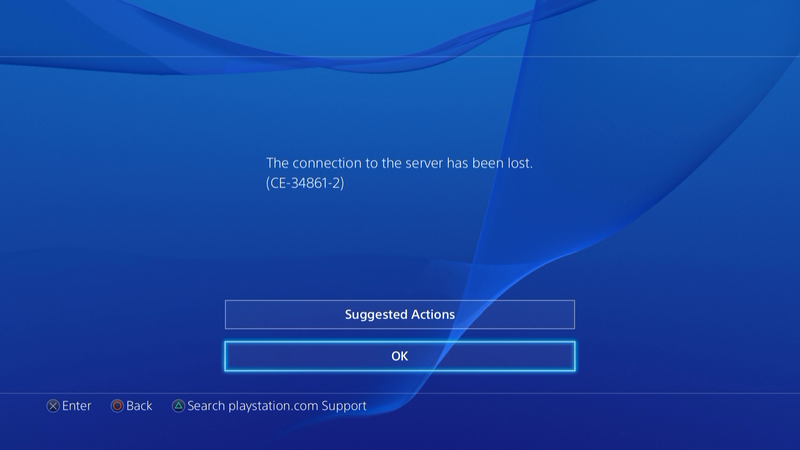 Attempting to connect to the PlayStation Store or any PlayStation Network services on the PlayStation 4 returns the "connection to the server has been lost" message seen above. Being unable to connect to the network also means any game I've downloaded from the PlayStation Store will not open, as the verification server cannot be reached. Sony has not replied to multiple requests for comment on the cause of these network issues and how it is handling the problem. As of this writing Xbox Live services have been up and running relatively smoothly since yesterday morning. A heavy influx of new users may have led to some of the issues we've encountered over the past few days. A popular theory regarding the outages is that they are the work of an online collective known as Lizard Squad, which had threatened previously to take down both services on Christmas day. However Lizard Squad claimed their attacks on the networks ended the evening of December 25. We will continue to monitor the situation and update should Sony respond to our continued queries. Update: Sony has posted a PlayStation Network status update on the PlayStation blog, citing high levels of "traffic designed to disrupt connectivity and online gameplay" as the reason behind network access issues. The video game industry has been experiencing high levels of traffic designed to disrupt connectivity and online gameplay. Multiple networks, including PSN, have been affected over the last 48 hours. PSN engineers are working hard to restore full network access and online gameplay as quickly as possible. Sony's wording here lends credence to claims the service has been the target of malicious traffic attacks, and the downtime is not merely a symptom of a large influx of new users.